Last Oct. 24, a cold, windy, rainy, miserable day, I planted some daffodil bulbs out in front of the house. All winter, I glanced at the spot where I planted them, yearning for the day I’d see some blooms there. Anything to pull me through a Vermont winter. In mid-March, the snow melted from the area where I planted the bulbs. Other people’s daffodils started coming up. Mine didn’t. I carefully picked up the branches that fell there during the winter, and every day for a week I looked, Nothing. I worried. How can somebody like me mess up something as simple as planting daffodils? No need to worry. After one warm day right around the spring solstice I Iooked again. The first tentative green shoots were up. Success! Looks like my daffodils were a bit late because the snow melted a little later in the spot I planted them than they did at some other people’s houses. Every day it seemed, the daffodils grew a bit. Funny how one can get excited over such a small thing. I even took the wholly unnecessary step of covering them with mulch one night in late March when the temperature was due to plunge to near 10. It’s like I’m a teenager assigned to take care of one of those fake babies to learn that parenting is a big responsibility. 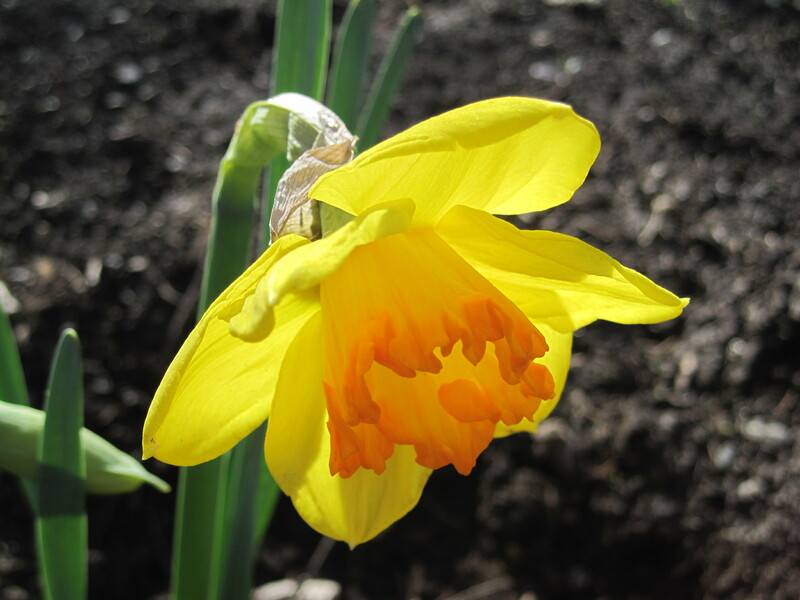 There’s only one way to make the spring daffodil event at my house even better next spring. I’ll go outside on a cold, rainy, windy day this coming October, and plant a bunch more. This entry was posted on April 21, 2010 at 10:49 am and is filed under Uncategorized. You can follow any responses to this entry through the RSS 2.0 feed. You can leave a response, or trackback from your own site.